By Ali AbunimahDespite appeals from thousands of people all over the world, Native American peers, and Palestinian civil society, poet and musician Joy Harjo has rejected pleas to cancel her performance at Tel Aviv University and respect a Palestinian call for boycott. But in a message on her Facebook page this morning, Harjo justified her decision to go ahead with the performance. Her message read in part:I will perform at the university as I promised, to an audience that will include Palestinian students. The students have written in support of me being here. I will let the words and music speak for that place beyond those who would hurt and destroy for retribution, or to be right. It is my hope that my choice will generate discussion and understanding for many paths to justice.Harjo also condemned what she called an “atmosphere of censure” around her decision. But in contrast to the outpouring of Palestinian calls on Harjo to cancel her performance, her claim that some Palestinian students supported it could not be substantiated. A comment by Facebook user “lamisfalasteen,” in response to Harjo’s message this morning, was typical:You acknowledge that the Palestinian situation is similar to that of your people, and yet you ignore calls for support. Palestinian civil society has asked that people of conscience heed their call for cultural and academic boycott. It is our non-violent way to resist the occupation. Here is Harjo's full statement on why she's performing:I sit in a hotel room in Tel Aviv. I am far from my tribal home in Oklahoma. In eternal time, each is a room in the same heart. 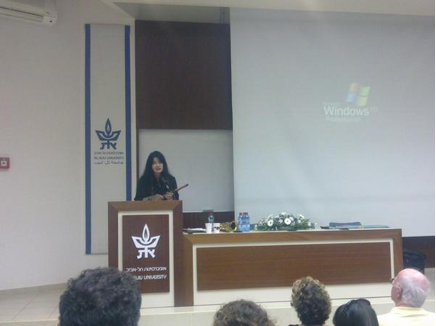 I was invited to perform and speak here at Tel Aviv University several months ago. I was a guest here nearly twenty years ago and remembered this place with a great fondness. I recalled the open discussions and the cultural mix of students. I accepted the invitation. I am aware of the nearly unbearable political strife here. These lands are in the heart area of this Earth. The Jewish people consider these lands their homelands. They have survived countless persecutions and suffered as they made their way home. The Palestinian people are captive in their own homes. There are checkpoints to enter and leave. They do not own title to a country. They are not free. This situation is much like that of my people. We were force-marched from our homelands. Then our lands of resettlement were stolen again. I am not so naïve as to think art is beyond politics. The arts are and have been used in the regeneration of the spirit of the people. They carry blood, memory and cultures. The arts can also be co-opted for political gain or loss. I am in the service of the source of the poetry and music. With that spirit there is no bargaining with governments, religions or ideologies. The morning after I left on my journey I received an email from a friend and colleague. He asked me to reconsider my trip. This was the first I learned of the US Campaign for the Academic and Cultural Boycott of Israel. I was puzzled at this request at such a late hour because this colleague had known of my plans to go to Tel Aviv for while. I came here for the opportunity to speak with and hear the voices of the people, especially the young. I came to be in support of justice and compassion. I don’t believe that the majority of the people in these lands or anywhere in the world are in support of the killings. Now my social media pages and message boxes are filled with a campaign to force a boycott, with messages of polarization, as if there is one way to poetry, resistance or empowerment. There are also messages of support. I will never forget being on stage the opening night of a large poetry festival in Durban, South Africa. Then U.S. President George Bush was bombing the Gulf and everyone hated the Americans. Each participating poet was given an elaborate introduction, except for me. I was introduced: “This is Joy Harjo. She is an American.” The heavy silence that followed was filled with hate. I was an object of contempt no matter what I sang or what I said for the rest of the conference. I was not in support of the killings on my behalf by the U.S. government. I had actively opposed them, but in the collective audience mind, I was implicated. I feel that same atmosphere of censure now in the ultimatum that I am being given to boycott. I admire and respect the scholars and artists who have backed the boycott. I stand with their principles, but they will not see it that way. I refused an invitation to the White House because I disagreed with George W. Bush and his politics. I stepped down from a tenured university position with security and benefits to register my disapproval of unethical practices involving a colleague and students and the persecution of other faculty members who objected. I have always stood in support of human rights, and the Palestinian cause has always been close to my heart. December 10, 2012 Tel AvivComment: Actually, she didn't quite say that Palestinian students support her. She said the audience will include Palestinian students, and the [unspecified] students have written in support of her. The second group of students could be different from the first group. It could consist entirely of Israelis. Harjo refused an invitation to the White House and stepped down from a tenured university position. What made her respond differently to this conflict than to those conflicts? Is it because she promised, and she considers her word inviolable? I could almost see that, though upholding a promise to defy a boycott isn't the place to stand on principle. It also would be interesting to hear what she said to the mostly Israeli audience. Did she challenge them on the issues? She was vague about her intent. "I came to be in support of justice and compassion," she wrote, but "I will let the words and music speak for that place beyond those who would hurt and destroy for retribution." Does that mean she addressed the injustices of the present situation? Or did she speak and sing "beyond" them, which means avoiding them? To me that's a key issue. If you're defying a boycott to engage in a dialogue, then it should be a real discussion of the Israeli-Palestinian conflict. Singing about peace and love in the abstract won't cut it. That's not standing in support of justice and human rights, it's ignoring them. For more on the Indian-Palestinian connection, see Harjo Faces Boycott of Israel and LaDuke on Gaza: "We Are Israel."